2010 Can go a few ways. 1. Amazing!!! World Series number 11!!!! Let's finishing gagging and get number 3 out of our heads and focus on what needs to be done to accomplish number 2. A. Health- The team must stay upright. It starts with number 5. That elbow that I'm more tired of hearing about than the phrases "Don't Go There," "He's my baby daddy," and "That's what she said" combined has seemed to have checked out fine. If he's healthy all year, we will be in the conversation on September 1st. The outfield. Ludwick must play 150 plus games. He's is our clean-up hitter. I know all of you love Matt Holliday and what he did for half a season, but give me 2008 Ryan Ludwick any day of the week and twice on Sunday to bat behind Pujols. If Luddy stays off the DL don't expect a .300 batting average, but you can expect 30 dingers and 110 rbi's. Please don't talk about any kids from Memphis coming up and playing the outfield. If we have two rookies in the line-up, we wouldn't win fat guy softball at Fenton Park. David Freese is bad enough, but if I hear one more word about Allen Craig I'm gonna lose my lunch. He'll be worse than Colby Rasmus was this year...do we need another .250 hole in the line-up next to Freese??? Let's groom one rookie at a time. B. Free Agency and Trades. I've already expressed my feelings on what the Cards should do in regards to Matt Holliday, like not sign him, but we do need another bat. Where's the pop??? The only two proven power threats are Ludwick and Pujols. Rasmus may hit upwards of 25 hrs, but Freese will most likely fall in the teens, and can we please all finally admit that Yadier Molina will NEVER EVER EVER EVER be a power threat at the major league level! We need to sign or trade for one more power bat, at a reasonable price. Too many of us are way too anxious to spend 100 million on Holliday and not look any further than that. If we could sign an Xavier Nady, or a Mike Cameron at a huge discount as compared to Holliday, we could keep an Allen Craig on the roster to groom and not count on for major production. The Nady or Cameron discount would keep the Cards in contention during this Carpenter-Pujols window that will close sometime around 2012. The off season is one thing, but mid-season is where the final pieces of championship teams are often put into place. Will we have the same flexibility in July of 2010 that we had in 2009? If we make the correct, not popular, moves this off season, we won't have to literally sell the farm in July again; we may just need minor tinkering, most likely in the bullpen. Ohh, and can someone teach Johnny Mo that every conversation doesn't need the phrase "at the end of the day" right before I nod off to sleep from a voice that I'm almost certain emits Quaaludes. Unlike most of my fellow followers of the Redbirds, I have faith in Franklin. Duncan and Larussa have to do a better job of managing his outings, not necessarily innings. August sealed the season for the Cards, but it killed Franklin. His arm was nearing death by the end of the month and we suffered the consequences in September. Franklin had 12 appearances in both July and August, in the heat, the ungodly heat of the Midwest. He didn't lose his nerve, he lost his stuff. He wasn't throwing meatballs up there, he started walking people, and he wasn't missing by much. If Franklin stays fresh into September and October I can guarantee a pennant and possibly a World Series. We have to come through again. We have to spend our hard earned money at the gates. The front office gave us all of the credit when they were able to make the moves for DeRosa and Holliday that put us in the playoffs. If we pack Busch Stadium again this season the club will have the money to spend. Remember, we pay their salaries by way of ticket sales and merchandise. We did our part last season, and in turn the front office gave us what we wanted, Holliday, DeRosa and a Central Division title. 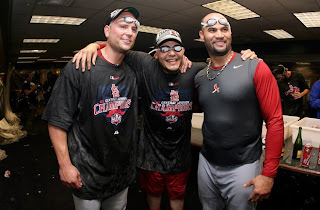 We have always come through for our Redbirds and I am certain we will again in 2010. That's what I have for you...it's not flashy, it's not controversial, but it makes sense. This is the Midwest, not NYC baby. There is only so much money to spend on payroll, let's do it right. We can't treat this off season like a weekend in Vegas after winning ten grand on the pick six.